It’s not hard to describe the pain of writing. You type and the other part of you says No, not good or sometimes scribbles in the margins in ink visibile only to you AWK. And so the first you backspaces and starts again. And again you hear, from the other guy, Nope. Awkward. And this goes on for quite awhile until you finish the piece, progressing in a way best described as an inside-outing of the Zeno’s arrow paradox. I am rewriting a section of this into my piece on waiting. The blog is the only place (perhaps you can tell – ugh) where the process above does not apply. And thus I’m beginning to have a sense that the most efficient way for me to get writing done is simply to scribble every night on here and then, later, go back and see what can be combed out of all this knotted stuff. I am combing more out of this knotted stuff, and it seems to be OK to do that. Interesting to think: I only write easily when I write under another name. When I have a sense that my own name is going to be on the thing – and it’s hard not to have that sense when I tap into the first two lines of every document THE TITLE and then MY NAME, right back to Catholic school training that, see also APOTAAAYM.) But under the pseduo, even though the pseudo is becoming increasingly less pseudoffective all the time, I can simply type. If I could remember my Derrida on some level other than a sort of intellectual muscle-memory, I could probably come up with something clever to say about all of this. 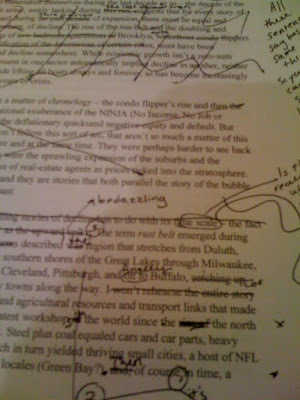 But now, really, back to the cutting, pasting, and strenuous editting. –Hey Gaz, look at this guy with the laptop. He’s been sitting there for three hours and keeps tapping some sentence out then deleting it. Been repeating that over and over. Hasn’t finished a damn thing all afternoon. Oi you mate, what’s your name when you’re at home then? –Er, it’s…it’s…Adsworth, Billy Alex Adsworth. –You’re having a Turkish bath! Tell us a poem then, smart alexander. Unread books, their promise of future balm. –I suppose so, but watch with the oxymoron there. Still, not bad for a Canuck, eh Gaz? Speaking of Catholic boys and incarnations of The Artist as a Young Stranger, are you familiar with this one? His funeral mass took place on Wednesday in the West Village–though he was in fact an Inwood Park street lad who came up as a teen hoops star in the same epoch and league as Lew Alcindor (later Kareem A-J). Jim’s work may turn out to have been deeper and trickier than many have suspected. As you’re reading Dream Songs, you might be interested in mixing and matching. And speaking of pseudo, I’m afraid Berryman’s “confessional” magnum opus rings a bit faux to me these days. (La noche oscura del alma academic style, self conscious, coy, curiously calculated.) Looking back now however JC’s dream work of an only slightly later period feels more and more like the real article. Jim was a wild navigator of dreams and one day may be fully recognized as such when the surrogate suffering poets of the “English department” have been blown away with the dust of time. And too, not to belabour the JB/JC comparison overmuch, he actually had an active sense of humour. I know! But look at this blog!